We’d love your help. 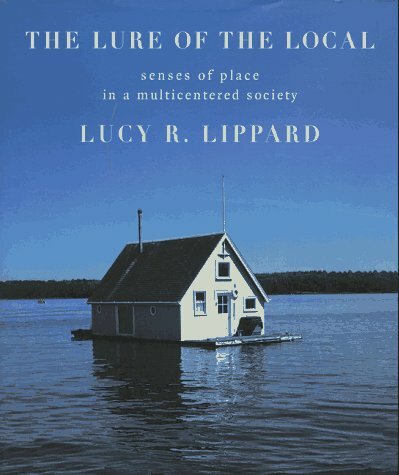 Let us know what’s wrong with this preview of The Lure of the Local by Lucy R. Lippard. To ask other readers questions about The Lure of the Local, please sign up. I picked this bad boy up at the museumstore at SF Moma. It is a handsome, weighty book, with a beautiful, interesting cover. The book made a good impression on me. My wife and I decided to buy this book because we have been interested in the theme of "landscape as witness". This is a concept we read about in Nancy Spector's accompanying essay in the Cremaster Cycle Guggeinheim museum catalog. Basically, the idea as it is expressed in Barney interpreted by Spector is that the landscape is a charac I picked this bad boy up at the museumstore at SF Moma. It is a handsome, weighty book, with a beautiful, interesting cover. The book made a good impression on me. My wife and I decided to buy this book because we have been interested in the theme of "landscape as witness". This is a concept we read about in Nancy Spector's accompanying essay in the Cremaster Cycle Guggeinheim museum catalog. Basically, the idea as it is expressed in Barney interpreted by Spector is that the landscape is a character in the narrative created by art. As a brief survey of Amazon.com will reveal, Lippard is a well regarded writer on art. Honestly, I'd never heard of her before. This could have something to do with me not being intimately familiar with the New York City art scene or otherwise involved with the art world except as an occasional museum goer. Art is sort of at the periphery of my set of interests. None the less, I found this a comprehensive, at times brilliant, survey of both artistic theories about the concept of place as well as a thorough documentation of the specific expressions of these theories in art work. Lippard's scope of reading and breadth of knowledge about art all over the United States (this book is entirely about the U.S.) is nothing short of stunning. The actual form of the book is a little difficult to explain, The book has a five part structure, each part with a title: Around Here, Manipulating Memory, Down to Earth: Land Use, The Last Frontiers: City and Suburbs and Looking Around. Each of these parts contains sub-chapters that are titled with various aspects of the five parts. Lippard's style is basically to situate each chapter with a brief survey of what other writers have said about the "subject", followed by a description of different acts of arts intermingled with commentary. Each of the pages also contains images with substantive critical passages. Along the top of each page, there is a running essay about the author's experiences growing up in Maine. I found her work to be fairly comprehensive: Although she has end notes and a thorough bibliography, I found myself doubting that any of them so totally nailed the relationship between art and the concept of place. If the author or her representatives are reading this, I would recommend updating this book in another couple of years. Ambitious work for sure! The format reminds me of a textbook/coffee-table book with what seems like a bonus-book ribbon running across the top of each page - containing a different (personal) narrative to complement the main text. Admittedly, I didn't read the ribbon text... it was just too much. Maybe it's a play on the concept of Multicentered? The book format definitely plays with that concept, and it's oddly distracting, and not in a good way for this reader. The book tries, in my opinion, t Ambitious work for sure! The format reminds me of a textbook/coffee-table book with what seems like a bonus-book ribbon running across the top of each page - containing a different (personal) narrative to complement the main text. Admittedly, I didn't read the ribbon text... it was just too much. Maybe it's a play on the concept of Multicentered? The book format definitely plays with that concept, and it's oddly distracting, and not in a good way for this reader. The book tries, in my opinion, to cover too much, so it's all kind of baggy. About the content: I enjoyed her mostly insightful commentary on the importance of place, the importance of staying connected to or learning about where one lives, and how public ART can enhance this experience. 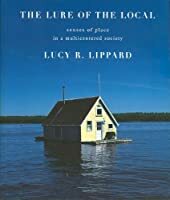 Sadly, this book was published in 1997, so it's quite outdated in some ways - I wonder what Lippard would say NOW about what social media and our extensive online world have done to diminish the primacy of place in our everyday life experience? I've become more or less a disciple of place, of knowing the land upon which I live through walking and hiking, and a disciple of real-time and, ideally, in-person interactions with friends and family. The online world has its place, but (for me anyway) it is woefully hollow and dehumanizing, yet it commands so much of our information and attention ... but what about art? How does ART exist in the online world completely disembodied from its source? Pictures? Performance? The real art objects and concepts still exist in real time in material form, and as Lippard might suggest, to be enjoyed in a public place with an appropriate CONTEXT for its creation and existence. The book has been quite thought-provoking (despite the trip back to graduate school in the 90s through quotes by Rebecca Solnit, Gloria Anzaldua, Paula Gunn Allen, and Guillermo Gomez-Pena... I mean, it was a heady time, but - again - narrowly focused through the lens of a (Marxist) ideological Left). With age, I have come to appreciate the MANY different ways and means to interpret and execute land use, development, and social progress; it does no one any good to vilify those with good intentions but prefer a different path to social enlightenment. An enlightening exploration on the idea of 'place' using cartography, identity and nomadism as (some of the) points of reference. Written with an art-critical standpoint, this book is as enjoyable as it is nicely laid out - punctuated with good imagery and great formatting. I borrowed this book from the library and I plan to have it on my to buy list. The author...Lucy Lipppard... writes theory in an accessible way. She also wrote a nice book I have lit=stedd about the work of artist Eva Hesse. Key concepts that can be applied wherever. How could I have forgotten this one, one of my all-time favorites, it's surely helped to steer my life and my worldview since first reading it in college. Since 1966, Lippard has published 20 books on feminism, art, politics and place and has received numerous awards and accolades from literary critics and art associations. A 2012 exhibition on her seminal book, Six Years: The Dematerialization of the Art Object at the Brooklyn Museum, titled "Six Years": Lucy R. Lippard and the Emergence of Conceptual Art", cites Lippard's scholarship as its point Since 1966, Lippard has published 20 books on feminism, art, politics and place and has received numerous awards and accolades from literary critics and art associations. A 2012 exhibition on her seminal book, Six Years: The Dematerialization of the Art Object at the Brooklyn Museum, titled "Six Years": Lucy R. Lippard and the Emergence of Conceptual Art", cites Lippard's scholarship as its point of entry into a discussion about conceptual art during its era of emergence, demonstrating her crucial role in the contemporary understanding of this period of art production and criticism. Her research on the move toward dematerialization in art making has formed a cornerstone of contemporary art scholarship and discourse.